Wildlife officials feel they have done everything in their power to prevent sea lions from eating the endangered chinook salmon. Previous efforts included dropping bombs that explode under water, and firing rubber bullets and bean bags at these sea lions, but now, actual death sentences have been issued for “repeat offenders”. 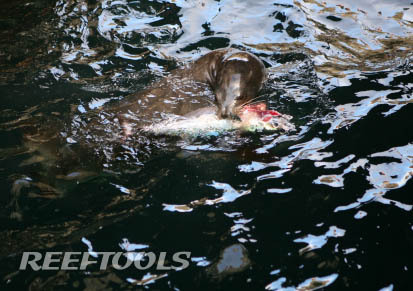 The first sea lion euthanized this year in an attempt to protect the chinook salmon population in California. Protestors say that may threats, including man-made dams, pose a much greater threat to the chinook salmon, and that these actions by Wildlife officials are unacceptable. In the first year of this program, 11 sea lions were euthanized, which 4 were captured, then transfered to zoos and aquariums. The Humane Society, leading a movement of critics, reports that fisherman catch three times as many salmon as the sea lions eat, and that hydroelectic dams on the Columbia create an obstacle for salmon as they attempt to return to the ocean. There is a natural evolution,some things go extinct, some survive. Humans are part of that cycle. The Sea Lions didn’t get the memo that the Salmon are endangered. They are just doing what comes natural to them. If there going to shoot seals, The seal should get to bite the shooter first. Preferable the trigger hand.